CVD Equipment Corporation supplies process equipment for Ceramic Matrix Composites (CMCs) for both product development or production. CVD Equipment Corporation has decades of experience in providing continuous reel to reel, web coating, or batch processing chemical vapor infiltration and deposition systems for CMCs. Please refer to our continuous transport engineering capabilities page for more information. CMCs are light weight, high temperature, corrosion resistant materials that are displacing high nickel super alloys in certain applications. In aircraft engines, CMCs can run hotter, leading to more fuel efficiency and less pollutants. The fuel and maintenance cost savings to commercial air carriers can be substantial. In industrial power turbines, the higher temperature operation of CMC materials leads to a reduction of both emissions and the cost of electricity. Our deposition systems also deposit functional coatings onto finished CMC parts. We use a low pressure high temperature CVD process to deposit a uniform, conformal, high purity, dense coating on a 3D shaped part. Our multi-chamber systems can increase production throughput by processing multiple chambers in parallel or sequentially. An example of where our equipment is used is in depositing a silicon layer onto a CMC part for aircraft engines. The silicon layer helps to protect the underlying CMC part from oxidation. To round off our capability, we also provide gas delivery and exhaust treatment systems that integrate with the deposition system to achieve a turnkey operation. Intelligent Unwind and Wind – optical sensing and automatic linear actuated positioning for aligning the payout from the bobbins to minimize rubbing / abrasion during payout and spooling. 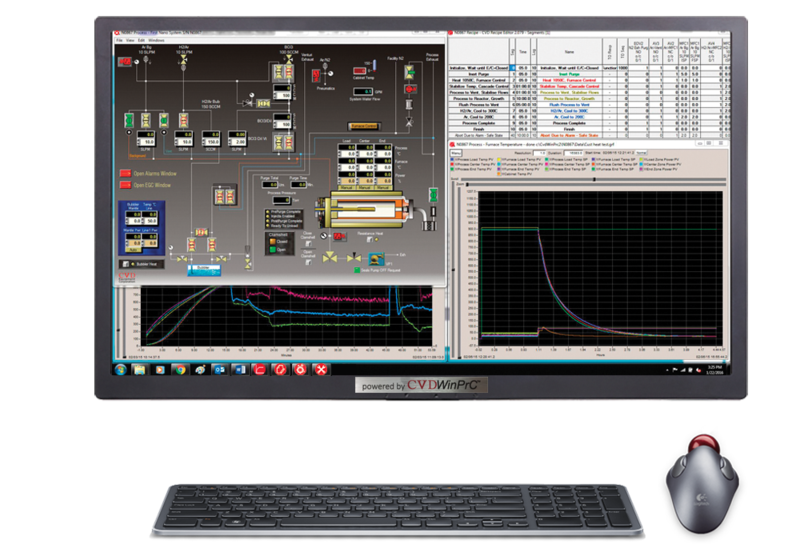 Operated through our CVDWinPrC™ process control software, the systems automatically log data and graphically show time-dependent values of user-selected parameters. CVDWinPrC™ also allows users to load preprogrammed recipes, modify, check and create new recipes, and view realtime or saved process data. The systems have application configured safety protocols embedded into relay logic, PLC, and CVDWinPrC™ software.